Life of Clement C. Moore, LL,D. In the early part of the present century New York was, to use the language of Washington Irving, "a little city where everybody knew everybody," but within the lifetime of a man it has attained such metropolitan proportions that the most famous men of the city,s tate, and nation may walk the length of Broadway without being recognized by one out of a thousand of its throng of citizens. At that time everything above Canal street was considered "out in the country," and the whole of Manhattan Island beyond, was occupied by farms, in most cases owned by men to whom they had descended from their Dutch ancestry. Interspersed with these were elegant country-seats of wealthy men, whose business and permanent residences were in the city, in the then fashionable district of Greenwich street and lower Broadway. Prominent for beauty, grandeur and picturesque surroundings, was "Chelsea," the country-seat of Major Thomas Clarke, an officer in the British army, who, retired from war's alarms, had purchased an extensive tract of land, and named his residence after the famous hospital that has been the home of so many of England's heroes. Major Clarke was born August 11, 1692, and bui8lt his country-seat about 1750. In 1745 he married Mary Stillwell. They were the parents of four children: Mary, Charity (born June 28, 1747), Maria and Clement C. Major Clarke resided here until the time of his death. During his last sickness the mansion was burned to the ground, he, himself, having been with difficulty rescued from the flames. It was rebuilt by his widow in a style of greater grandeur. Charity Clarke, the second daughter, married Rev. Benjamin Moore. This venerated prelate, whose life is so important a portion of the Ecclesiastical history of New York, was born Oct. 5, 1748. He was the son of Lieut. Samuel Moore, and great-great-grandson of Rev. John Moore, the first minister in Newton, Long Island, and who died there in 1657. He was educated at King's College (now Columbia) and was afterwards its President. In 1774 he went to England and was ordained to the Episcopal ministry. Returned to New York he was appointed assistant minister of Trinity Church, and held this position till 1800, when upon the resignation of Bishop Provost, he became its Rector. The next year he was consecrated as Bishop of New York, and performed the duties of that high office, with the highest credit, till the time of his decease, which occurred Feb. 27th, 1816. The country-seat, "Chelsea," came by inheritance to Bishop Moore and his wife, and here, on July 15th, 181, was born their only child, Clement Clarke Moore. At that time there was a high hill in the vicinity of what is now Twenty-third street, which sloped rapidly to the Hudson river which flowed at its base. On the summit of this elevation stood the family mansion. Its exact location was on the south side of Twenty-third street two hundred feet east of Ninth Avenue. The grounds were terraced and beautiful, and enclosed almost the entire district between Nineteenth and Twenty-fourth streets, west of Eighth avenue. For long years it remained a thinbg of beauty, the home of an honored and cultured family. In the meantime the "Great City" advancing with giant steps had reached and even passed beyond this region. It was no longer "the country." When the corporation ordered a bulkhead built along the river, it was felt that the time had come to abandon the ancient home. The mansion was destroyed about 1850, and the lofty hill, now leveled to its base, has long since gone to fill up the water lots on Tenth Aveue. Of Clement C. Moore it can be said that he was born surrounded by all the advantages that wealth, education and honored lineage could bestow. After a careful training under his honored father, he was graduated from Columbia College in 1798. It was intended that he should enter the ministry, but he never took orders, and devoted his life to teaching and literature. Being a scholar of great attainments and well versed in the ancient languages, he published in 1809 a Hebrew lexicon, and thus became the pioneer in the works of Hebrew lexicography in this country. In the words of its author: "The design of this work is to enable any person acquainted with the general principles of language, without the aid of a teacher, to read and understand the Holy Scriptures in the original Hebrew," and he modestly expresses his "hopes that his young countrymen will find it of some service to them, as a sort of pioneer in breaking down the impediments which present themselves at the entrance of the study of Hebrew." It has been well said that the greatest scholars seldon make the best of teachers, from the fact that they too frequently assume that what is plain and easy to them, must be equally so to others. But this great work of Dr. Moore was evidently written by a man to whom learning had been a labor, and who was anxious to spare others the toil and difficulty which he had himself experienced. In 1818, Dr. Moore presented to the Episcopal Seminary the entire block, bounded by Ninth Avenue, Twentieth and Twenty-first streets, and extending to the Hudson river. This tract, then valuable, would now be a princely gift, and upon it stand the imposing buildings of the General Theological Seminary, one of the most important institutions of the Episcopal Church in America. To the advancement of this institution the best labors of his life were devoted. In 1821, he became Professor of Oriental and Greek Literature, and retained that position during his life. The brief intervals of time which could be spared from his arduous labors were devoted to the writing of short poems chiefly for the diversion of his children, and among these were his famous "Visit of St. Nicholas." This little poem, which has given its author a fame which his greater works have failed to bestow, was written in 1822, as a Christmas present for his children, which was highly appreciated. Among their many friends were the family of Rev. Dr. David Butler, then rector of St. Paul's church, in the city of Troy. The eldest daughter of Dr. Butler, while visiting the Moore family, saw the poem and quickly copied the verses in her "album" (an article which every young lady at that time was supposed to possess), intending to read them to the children at the rectory. She was so impressed with their value that she sent a copy to an editor, and they were first printed in the "Troy Sentinel," of December 23, 1823, accopanied with a cut illustrating Santa Claus on his rounds, and preceded by an introduction by the editor. Strange to say the name of the author did not then appear. It is said that Dr. Moore was displeased at first, as in his opinion the poem had slight literary merit, but it instantly won general favor, and for years the republication of the verses at Christmas time was one of the most joyous features of the newspapers. Henry's first cousin and next door neighbor, Judith Newcomb Livingston, is the grandmother of Frances Hart Butler, whose sister-in-law, Harriet Butler, gave the Christmas poem to the Troy Sentinel. It was next printed in various "School Readers," and this brought it to the knowledge of whole generations of children, and nothing was more popular among them. It has been translated into foreign languages, and a learned editor once informed us of his surprise and gratification to hear them recited by a little girl in a school in Germany, in her native tongue. It may be safely said, that no poem written by an American has been reprinted in so many forms. In 1844, the various poems written by Dr. Moore were published in a small volume, but the only one that has attracted the slightest attention was the one that the author considered of so little merit. In 1859, an edition of this little poem was published in paper covers for children, and illustrated by the famous artist, Felix O.C. Darley, in his inimitable style. Nothing that adds to the happiness of the world can justly be called little. Men have labored and toiled and passed sleepless nights and laborious days, and for what? For immortal fame. It has fled from them like a shadow, and has alighted uncalled for and unexpectedly on such apparently trivial things as "Home, sweet Home," the "Legend of Rip Van Winkle," and the "Visit of Saint Nicholas." It shows that it is the great body of readers, and not the authors, and least of all the professional critics, whose mission it is to decide what is valuable and what is worthless. The last literary work of Dr. Moore was a "Life of George Castriot, surnamed Scanderbeg, King of Albania." This hero of the last days of the Middle Ages bears the same relation to the European Turkish Provinces that El Cid bears to Spain; a position half historical and half legendary. The work is a modernized and greatly improved form of an old English translation of Jacques Lavardin's history, printed in 1596. It is the only reliable history we possess of the exploits of the man, "who with unequal arms resisted for twenty-three years the power of the Ottoman Empire; and two conquerors, Amurath the Second and his greater son, were repeatedly baffled by a rebel whom they pursued with seeming contempt and implacable resentment." Such was Scanderbeg, "the heroic Prince of Epire and the great enemy and scourge of the Turks." He died June 17, 1767, and no Scanderbeg succeeding Scanderbeg, the Turks possessed the land. No higher tribute of unintended praise was ever given to a man by his enemies than was paid by the Turks themselves, when they violated his sepulchre and used fragments of his bones for amulets, in the superstitious hope that they would endow them with his good fortune and inspire them with his courage. In 1862, Dr. George H. Moore, of the New York Historical Society, resolved to obtain, if possible, from its modest author, an autograph copy of his famous poem. The request was complied with, and a facsimile of the original, now in the library of the society, is here presented, with its kind permission. 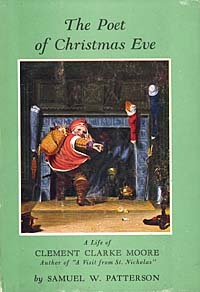 The venerable author stated in a letter, that when a boy, he first heard the story of St. Nicholas from a rubicund Dutchman who lived near his father's residence. After a life of usefulness and honor, Dr. Moore died at his summer residence at Newport, July 10, 1863. His remains rest in a vault in St. Luke's church, in Hudson street, New York. His true monument is the Theological Seminary, of which he was the liberal patron, and foremost among its company of learned instructors. The learned works upon which the talented author employed so much time and labor, have long since been superseded by works of still deeper research. But the man is yet to be born who can write anything to supersede the little poem that has made St. Nicholas and his tiny reindeer living and breathing realities to thousands of children throughout our broad land.